Chunky Monkey Bars: Chocolate Chip Peanut Butter Banana Bars: A delicious peanut butter banana bread bar filled with chocolate chips and chopped walnuts. Directions for Gluten-Free Peanut Butter Chocolate Chips Bars along with the traditional recipe. Thank you to Bob’s Red Mill for sponsoring this post. As always, all opinions are mine and I only share products I love and am truly passionate about. There is something magical about banana and peanut butter recipes. I think I could start every day with a serving of Peanut Butter Banana Oatmeal or a slice of freshly baked bread slathered with peanut butter and sliced banana. 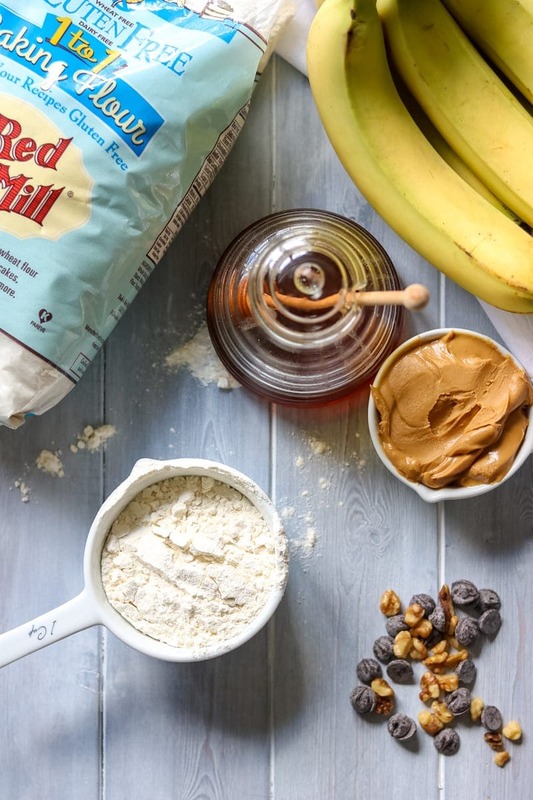 When you throw chocolate into the peanut butter banana mix–WOW! I am in a bit of serious heaven. These Chocolate Chip Banana Bars are filled with peanut butter, sweetened with banana and a bit of honey and studded with chocolate chips and chopped walnuts. 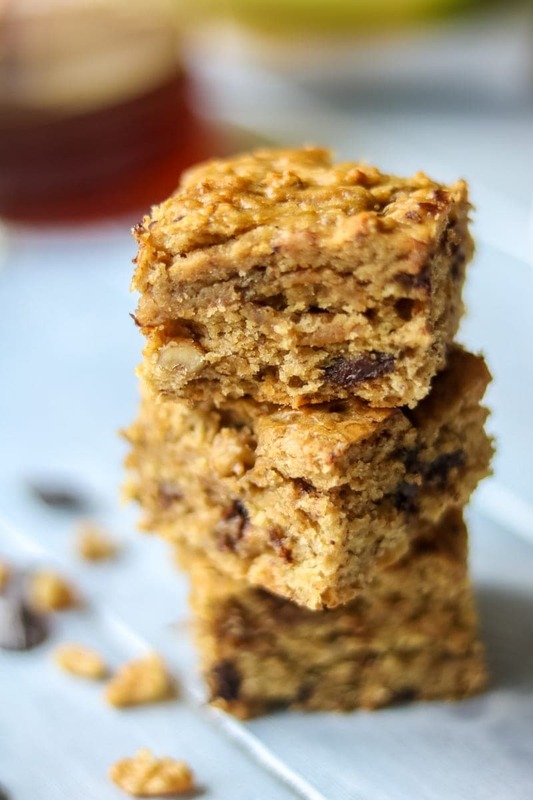 Chunky Monkey bars are reminiscent of Chocolate Chip Banana Bread, as they are soft and fluffier than most blondie cookies, and made in one pan with only 5 minute prep!! Talk about easy!! Peanut Butter Banana Bars are made in 5 minutes and with only common pantry staples. The batter for this cookie bar is in the form of a bar–meaning NO rolling, NO scooping–just pour into pan and bake! These cookie bars are made with Bob’s Mill Flours and Bob’s Red Mill products are of the highest quality making baked goods truly shine. These Banana Peanut Butter Bars can be made Gluten-Free as well for a perfect gift to give someone with a gluten intolerance or Celiac Disease. These Peanut Butter Banana Blondies have the magical combination of peanut butter, chocolate chips, and banana!! One of the things I love about Bob’s Mill flours is that I can trust their flours to yield the BEST baked goods. And that is true when it comes to using their Gluten-Free 1:1 Flour Blend as well. By just replacing the all purpose flour with the gluten-free flour blend, I can easily make any baked good Gluten-Free. And for those people avoiding gluten, this is the PERFECT cookie to treat them to! If you have a tree nut allergy, leave out the walnuts. If you have a peanut allergy, use almond butter. If you have a dairy allergy, use dairy-free chocolate chips, or omit chocolate chips for plain Peanut Butter Banana Bars. It is best to sift the flour with the baking soda and salt to prevent any clumps of baking soda in your dough. If you skip this step, just be sure to whisk together the dry ingredients before adding the wet ingredients. Be sure to only just mix these bars until just combined to keep them from being tough. I love to bake these chocolate chip banana bars on parchment paper, so I can lift them out of the pan with no worries of the bars sticking. If you don’t have parchment paper, be sure to grease the pan well with cooking spray, butter, or coconut oil. 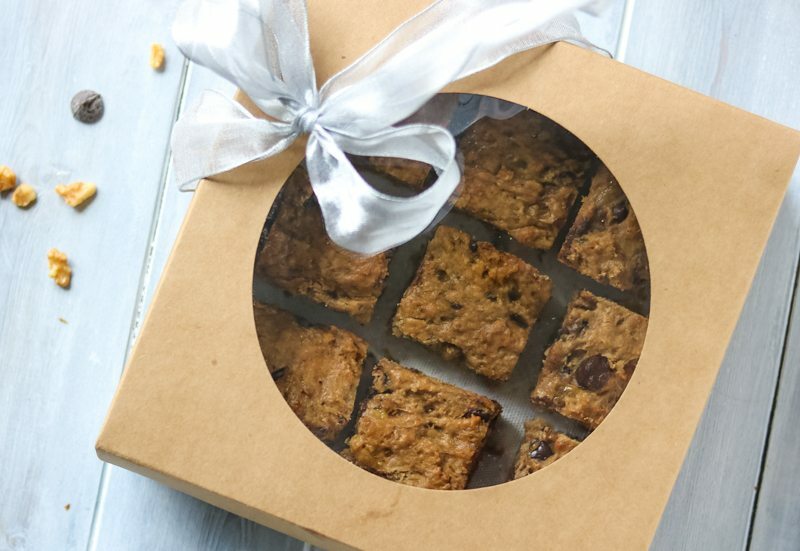 To give these Peanut Butter Banana Bread Blondies as a gift, allow to cool, cut into squares and package in box with a bow. Preheat oven to 350 degrees and line 8x8 baking pan with parchment paper or grease well. Heat peanut butter for 30 seconds in large bowl. Mix in honey, bananas, egg and vanilla. Mix dry and wet ingredients together until just combined and stir in chocolate chips and walnuts. Bake for 17-20 minutes, or until toothpick comes out clean. Cool on wire rack completely and then slice into 12 bars. Get your coupon for $1.00 off Bob’s Mill Baking Products HERE. Love that these can be made GF. My youngest is gluten intolerant and he loves sweets so I know he’s going to love them!! Love baking for others, and love that your mom had the neighborhood kids over to make cookies for others! These bars have allll the good things tucked inside! They look super tasty! I feel the same way about baking! 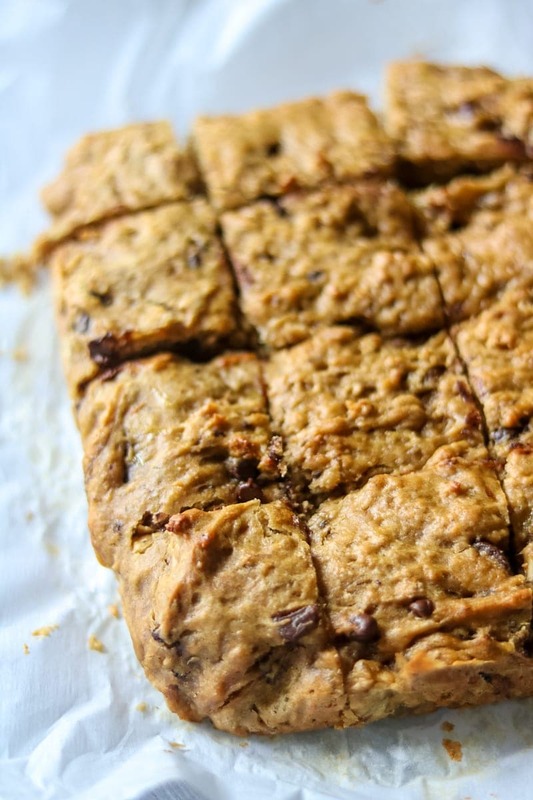 These peanut butter banana bars are a must make! Erin–these are the PERFECT bars fo you! Chocolate, peanut butter and banana – always a winning combination! Who wouldn’t love to receive these bars as a gift!!! These don’t seem hard at all and would make a great gift for the holidays! These bars look so delicious! My family will devour them! Thanks Anna–I hope you enjoy them. Hi can I replace coconut flour or almond flour? Hi Sofia! You can typically substitute 1:1 with almond flour for the gluten-free flour. However, almond flour typically requires more egg or binding agent, so the recipe might need to be altered so the bars would not be overly dense. I have not tried myself. As for coconut flour, I would not try to substitute 1:1. Coconut flour is much harder to use in baking with success without altering other ingredients. I love this recipe, I doubled the recipe and used a side cookie sheet. I knew it was a winner when the aroma drifted through the house . We had Pecans to use up , the results were amazing! Oh yum, love the addition of pecans. I hope they are a hit at your Superbowl Party.